This page was created by Jeff Miller, who attended Duke from 1968 to 1970, and hung around the station quite a lot (too much, in fact, as I should have been attending classes now and then). I welcome improvements to this page from former WDBS personnel in the form of reminiscences, pictures, and any other information you'd like to share. This page was last updated on Jan. 26, 2018. An amateur radio station using the call letters W4AHY operated from the Duke campus in the 1930s. In 2009 Peter B. Kingman contributed to this web site several photos of the station (which can be seen below in the pictures section). He reports that his father, Robert W. Kingman, who graduated from Duke University in 1938, was in the Electrical Engineering course and helped out with the station. 7128 K. C. 14256 K. C.
A 1930 Duke University publication reported that the amateur radio station W4AHY was operated by the Engineers’ Radio Association, which conducted code and theory classes for members. A 1939 Duke University publication mentions the station and says that two 100-foot towers have been erected to support the antenna. 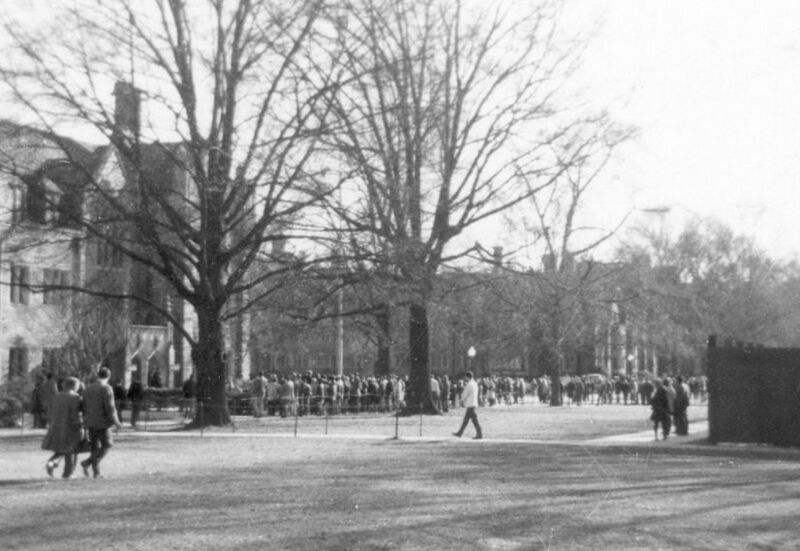 As far as is known, the earliest broadcast station at Duke University was the carrier current station WCDC, which began operation in the fall of 1947. 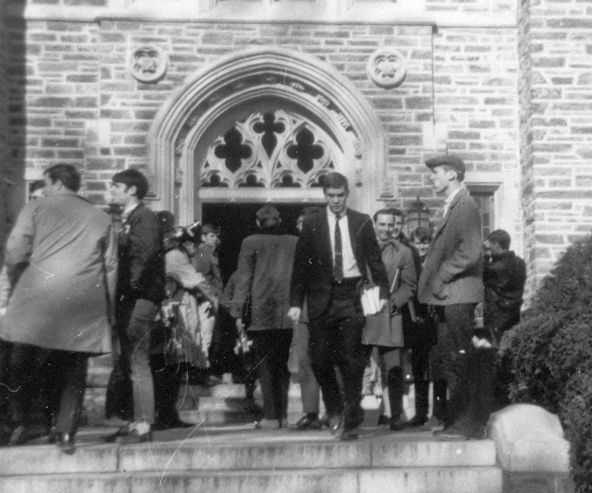 The station operated on 560 kHz and the call letters stood for "We cover Duke campus." The station was started by some classmates from Rocky Mount, North Carolina, with the equipment mounted on a desk in the corner of a dorm room. The WCDC call was also chosen because it was similar to WCEC, the hometown station where one of the students had worked. WCEC stands for "We cover East Carolina." The letterhead also has: "Carrier current system. Facilities include mobile or portable 2-way FM radio equipment for remote programs." The address given is Box 4580, Duke University, Durham, North Carolina. 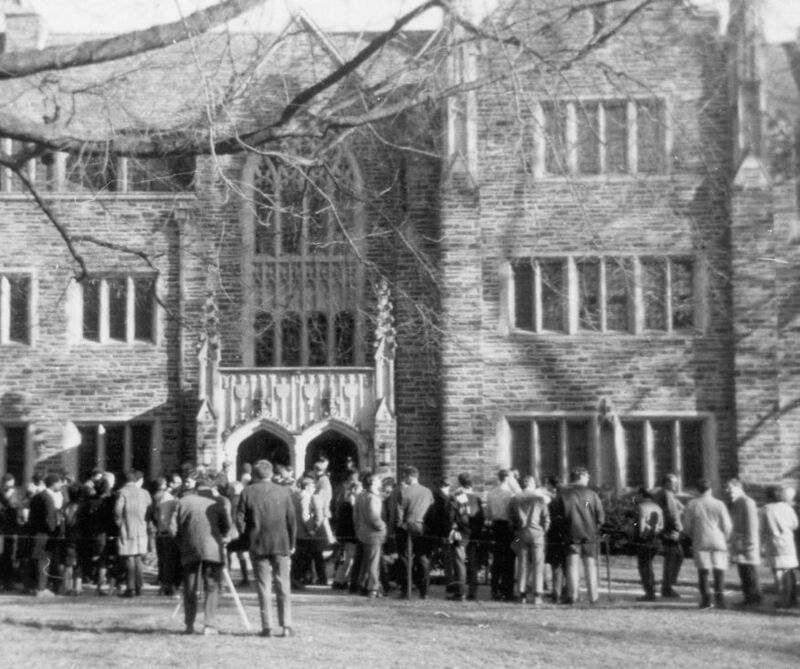 The original concept of a Duke Campus Radio Station was conceived by three roommates in the KA dorm (in the Clock Tower) in 1947. The transmission system was plugged into the dorm power line. 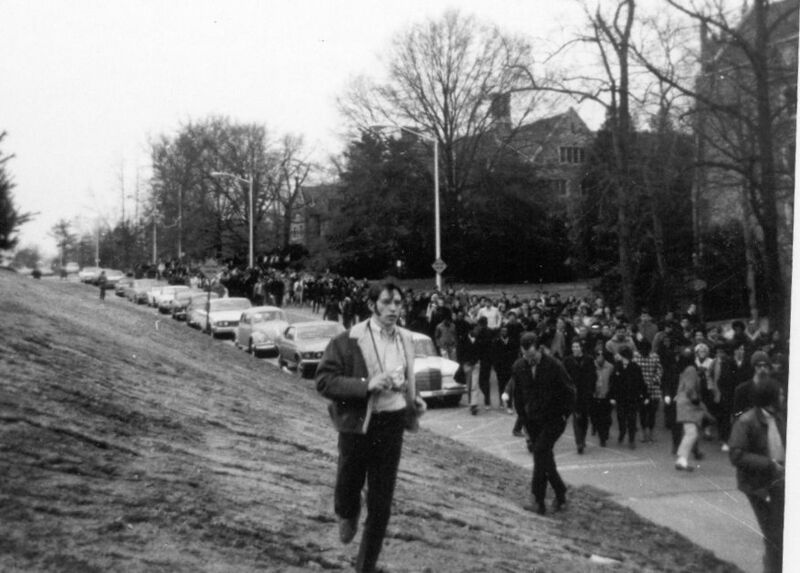 At Duke, the reception limit was a maximum of 285 feet from the main power line that covered both campuses - and all dorms - you could even pick the station up on a car radio traveling between the two campuses since the power lines followed the road. The first call letters were WCDC - "WE COVER DUKE CAMPUS." 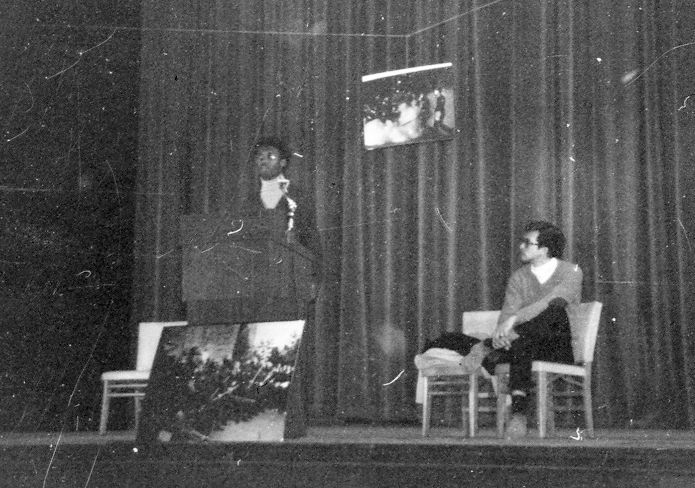 The station was started as a money making project for the three students involved. The students, E. P. (Sonny) Elmore, Jr. (50), Ed Hillman (49) and Archie M. Mathis, Jr. (51) had been classmates at Rocky Mount High School in Rocky Mount, N.C. The initial equipment was mounted on a desk in the corner of the dorm room and plugged into the room’s electric socket. 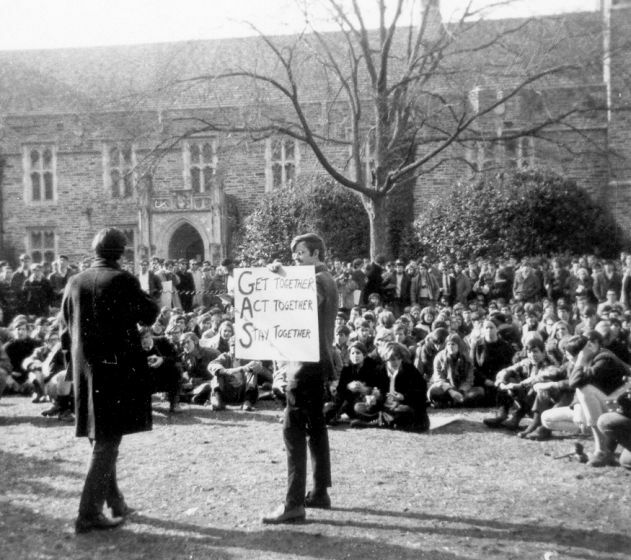 When the Duke Administration (Deans Herring and Cox) learned of the commercial aspects of the project, it was frowned upon. However, the Administration encouraged the students to convert the idea into a school activity. On May 15, 1950, WDBS began broadcasting as a carrier current station on 560 kHz, the same frequency as the earlier WCDC, and with some of the same personnel as WCDC. WDBS had its formal opening on the night of October 2, 1950. The station broadcast from the basement of the Gray Building. More detailed information on the beginning of WDBS appeared in an article in the October 1950 Duke Alumni Journal, which is available below. I read with great interest your article regarding WDBS, the first campus radio station [Retrospective, March-April 2012]. I was the first station manager of WDBS when the station went on the air in 1950. The three men named in the article actually convinced the administration to approve the station, but after funding was found, as manager, I had to schedule programming, write scripts, train people, and find talent. We all worked very hard; I spent many nights and days at the station, and even sold time to local merchants and national sponsors. We even carried The Perry Como Show, sponsored by Chesterfield. I’m the one in the center of the picture with script in hand. I’m delighted that the station progressed so nicely over the later years. On a Duke alumni web page Stu Greenwald ('53) wrote: "While at Duke I worked at WDBS doing the play by play of all the baseball, football and basketball games." 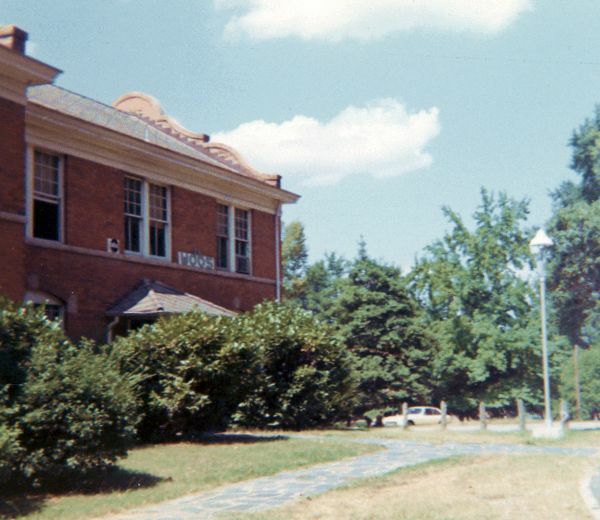 In 1963, WDBS moved to the Bivins Building on East Campus. 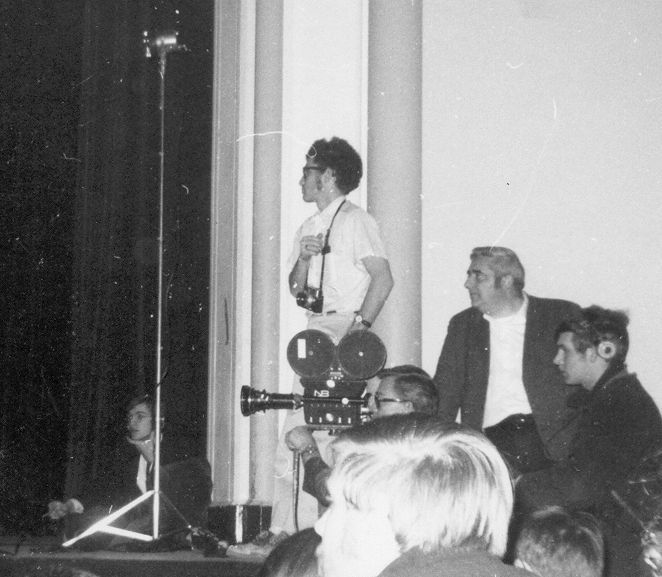 In 1965, after going off the air for the first semester while new transmitters were installed, WDBS increased its schedule to 24 hours per day. In the 1968-69 school year, WDBS operated on 560 kHz. The five-minute newscasts of the American Contemporary Radio Network (part of ABC radio) were broadcast at 55 minutes past each hour, except during periods when the station was unmanned and relied on the automated record player (known as "Otto"). At the start of the 1969-70 school year, the frequency was changed to 1600 kHz because it was felt that there would be less electrical interference in the upper part of the AM band. The station carried newscasts of the Metromedia Radio Network. In December 1970 an application was filed with the FCC for the sale of WSRC-FM to WDBS Inc. for $60,000. In 1971, WDBS Inc., a non-profit corporation, purchased the license of an existing 3000-watt FM station in Durham, WSRC-FM, thus allowing WDBS to broadcast on 107.1 MHz FM to a much wider audience. The May 31, 1971, issue of Broadcasting magazine reported that WSRC-FM, owned by WDBS Inc., requested the call letters WDBS(FM). Broadcasting continued for a while on the campus-limited 1600 kHz frequency. In 1972, WDBS moved its FM transmitter to a new site with a somewhat taller tower. In August 1972, the legendary Fuzzy Mountain String Band recorded their album Summer Oaks & Porch live at WDBS, according to the website http://redclayramblers.tripod.com/fmsb.htm. I worked in radio back during that industry’s Jurassic, when disc jockeys still picked the music and it was okay for everybody to have fun. Even commercial stations were about as corporate as the corner bar. My best years were spent at WDBS, a commercial "progressive" rocker incongruously owned but not operated by Duke University. Its operators were a bunch of deeply committed and barely organized folks who, in retrospect, resembled the free software and open-source cadres of today. With no profit motive and the lousiest signal on the dial, we had a hard time selling advertising. So we'd make up ads for things that didn't exist and run those instead. Many were by a weird announcer named Doctor Dave. That was me. My nickname today is a fossil remnant of that old radio persona. We ran ads for Bangweasel Stone & Rubber Company, Mumbling Pines Apartment Village and Wellington Raffelators. In many cases the actual nature of the business was left unrevealed. "If you need a pipe cleaned or a zipper laid, we'll do the job for you... remember you can't take a customer without taking his money." One fake ad with a recognizable purpose pushed a record collection that consisted of "All the world’s most beautiful music, all at once." The listener was then treated to an overdubbed blast of countless simultaneous music selections. A photo on this website taken in May 1975 for the WDBS Program Guide shows Station Manager Kathy Stanford, Program Director Steve Tulsky, News Director Celeste Wesson, salespersons Dave Searls and David Kramer, and deejays Steve Haughton, Hank Kamradt, Bruce Babski, Mitch Ratliff, Eddie Taylor, Chris Carrol, Cabell Smith, Bob Ballard, and Tom Guild. The photo was provided by Tom Guild who recalls at least three key staffers at the time who were not in the photo: Bob Conroy and engineers Glenn Axelrod and Glenn Bilane. Guild writes, "I was part of the 'DBS 'family' from August 1971 until February 1976, while the station was semi-commercial on 107.1, but operating with a student staff at least for the first few years. I started as an announcer/news guy while still in high school in Durham and stayed on while at Duke." At the time of the photo, he writes, "the staff was semi-professional. In other words, we worked 40 hour weeks, but were only occasionally paid, and not much at that..."
Stuart Troutman writes, "I was a steady staff member at WDBS between about 1974 and 1981. I knew Bob Conroy, Tom Guild, Rob Gringle, Cabell Smith, Steve Tulsky, Bruce Babski, Steve Haughton, Nancy Ross, Dave Searls, Ken Ross, Cathy Dunn, Shanga Sadiki, Celeste Wesson, and a bunch of others whose names I've forgotten. I had the unenviable task of migrating the format from its free-form "rock" staple to the day-classical/night-jazz plan in another studio location. Very painful and quite thankless. The station was vital in its prime. Unique, pivotal, groundbreaking. ... Those were unique days. Bob Conroy was a mentor, and I'd love to make contact with him again. Great guy. 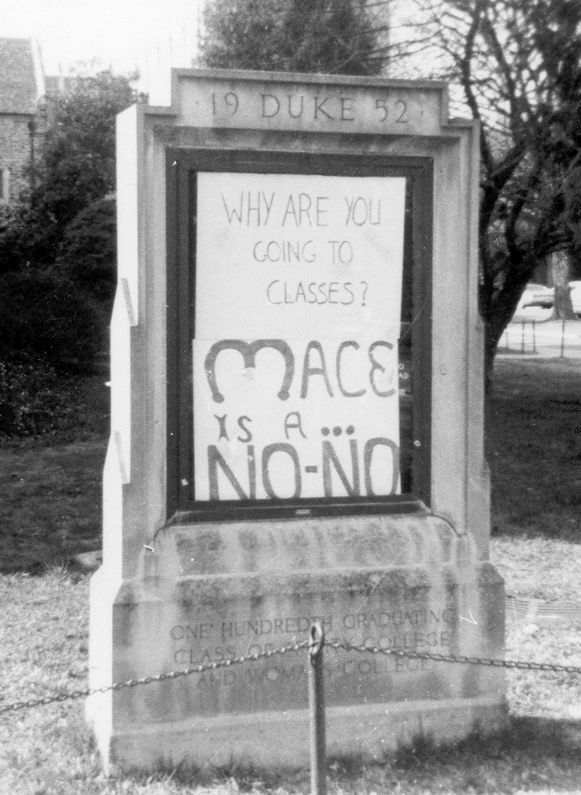 I was actually a student at UNC, studying radio/tv/cinema, and I was among the original staff at WUNC-FM at Chapel Hill. I brought in the very first feed of "All Things Considered" there. My long stint at WDBS was my chance to do my own music programming, which was what inspired me. I remember our Sr. Engineer was a guy named Jim Davis, who did his own oldies show at an AM station in Durham (WDNC, I think?). Jim and I used to do regular transmitter tweaking by telephone (very primitive technology!). Cabell Smith did the daily classical show on WDBS. Rob Gringle was another veteran. Shanga Sadiki did the Sunday jazz show (which I inherited from him). Celeste Wesson of course went on to news fame with NPR in South California. I distinctly recall a marathon broadcast that I was forced into, when the Triangle was plunged into a snowstorm paralysis one winter - I think I was on the air for damn near 24 hours straight. Shanga finally showed up to relieve me by managing to hike to the studio, 'cause road travel was impossible. I was delirious, babbling on about school closings over & over. I fell asleep on a studio sofa. 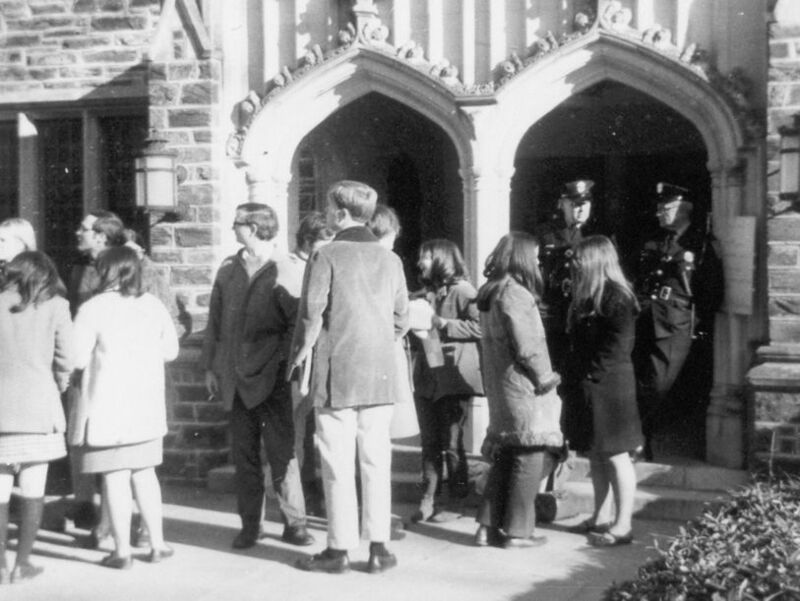 I remember very well that old 2-story brick building on the corner of the old East Campus of Duke’s "women’s college". (I had a girlfriend in a nearby dorm.)" The 1975 Broadcasting Yearbook shows WDBS(FM) operating on 107.1 MHz with 3000 watts and an antenna height of 295 feet. The address is Box 4742 Duke Station, Durham NC 27706. The telephone number is 919 684-3686. Station personnel are: Bob Conroy, president; David Parker, general manager; John Rocap, sales manager; Steve Ulsky, program director; Katherine Stanford, operations manager; Bruce Babski, music director; Celeste Wesson, news director; Glenn Bilane, chief engineer. The 1980 Broadcasting Yearbook shows the following station personnel: Robert Conroy, president; Kathy Cheatwood, general manager; Dewitt Long, program director; Steve Haughton, music director; Chris Bruning, commercial manager; James Davis, chief engineer. My involvement with WDBS came late in the game—my friend David Weaver and I launched a weekend show called Bottom of the Barrelin (I think) 1981, an eclectic mix of roots and acoustic music. Within a year of our debut, Duke switched to the classical/jazz format, and most of the staff was pushed out. We survived the cut for several more months before Duke pulled the plug on us as well. It was a depressing time. One legendary story I vaguely recall was that someone (Shanga?) 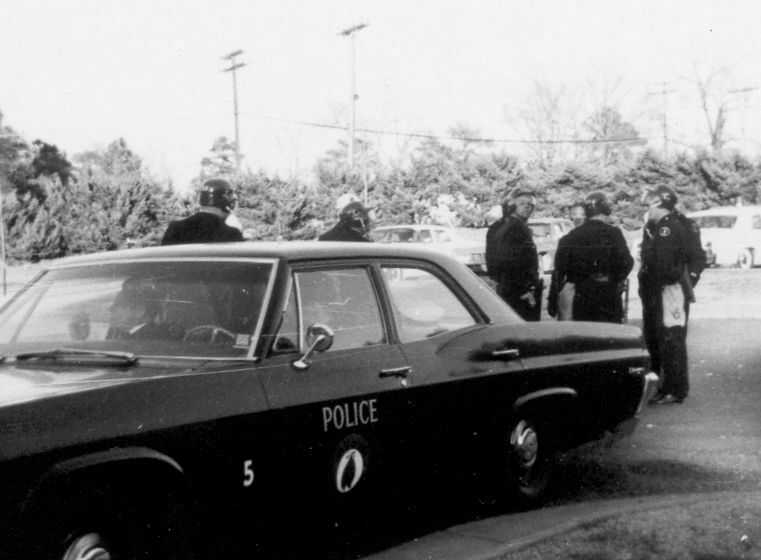 barricaded himself in the transmitter building off-campus after the switch and ranted about Duke and WDBS until the cops broke down the door and hauled him off. Someone else could provide more details, but it was a golden moment in radio. David also hosted the Orange County Special on WXYC, which I took over from him when he moved to New York in 1982 and ran for the next 13 years. 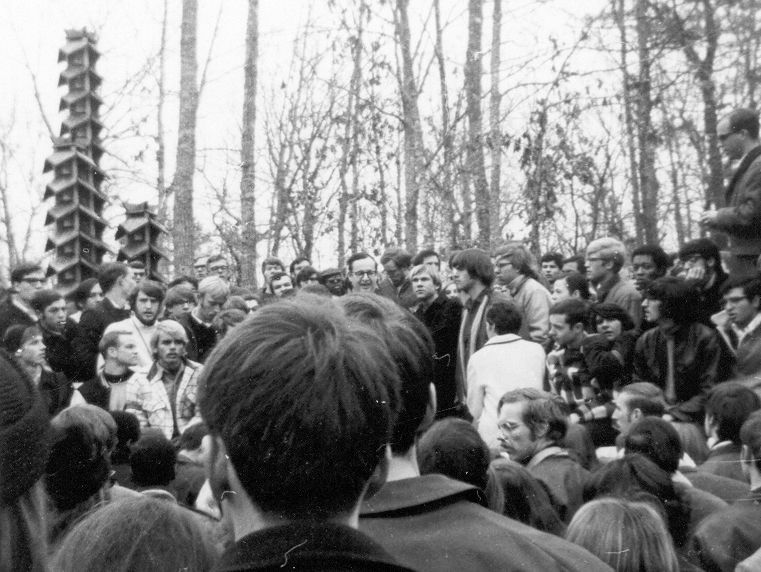 I now host Roots Rampage on the relatively new community station in Carrboro-Chapel Hill, WCOM (www.communityradio.coop), which can be heard online—it carries on the WDBS tradition better than any other local radio outlet. Ed Rock Crabtree recalls that during his first stint at WDBS from July to November 1982, the station played classical music all day and jazz all night. James Lee, a WXDU DJ, writes in a 2003 email that WDBS started the Back Porch Music program which later moved to WUNC. On March 11, 1983, WDBS’s valuable commercial FM license was sold to Classic Ventures, Inc. of Durham. The call letters for 107.1 MHz were changed to WFXC(FM). Crabtree recalls that his second stint on 107.1, from November 1983 to February 1984, occurred after the sale of the station, at which time it played easy listening music. 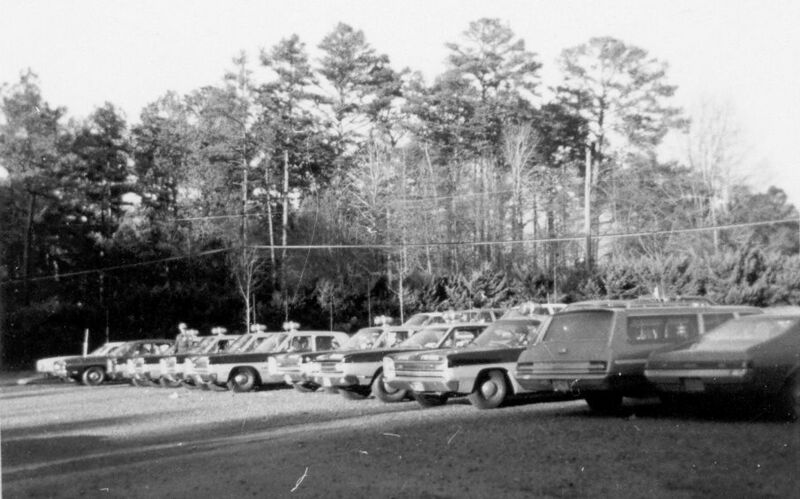 He also writes, "We also moved from Broad Street during that time, and for several months, including the horrific cold snap of late 1983, transmitted from the transmitter shack on Rose of Sharon Road in north Durham." Meanwhile, WDUK received approval and funding to convert to FM broadcasting as WXDU(FM), on the non-commercial frequency of 88.7 MHz. 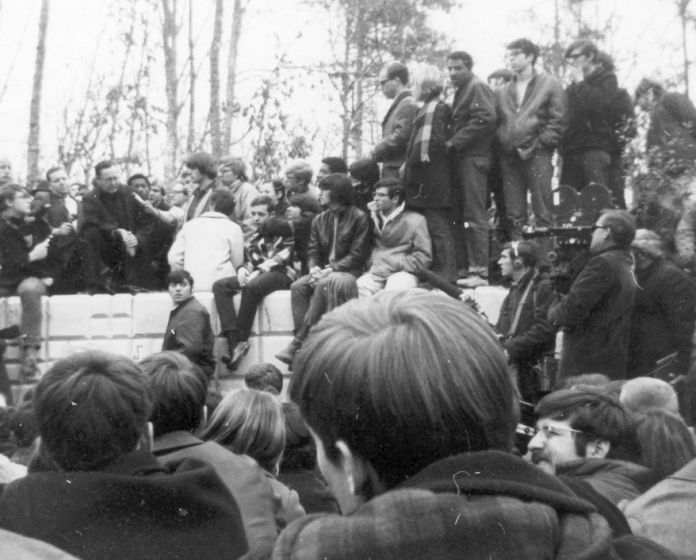 WXDU(FM), the present Duke University radio station, went on the air in November 1983, according to the 1986 Broadcasting Yearbook. According to the WXDU page on Wikipedia, the station went on the air in October 1983 with the song “Station to Station” by David Bowie. 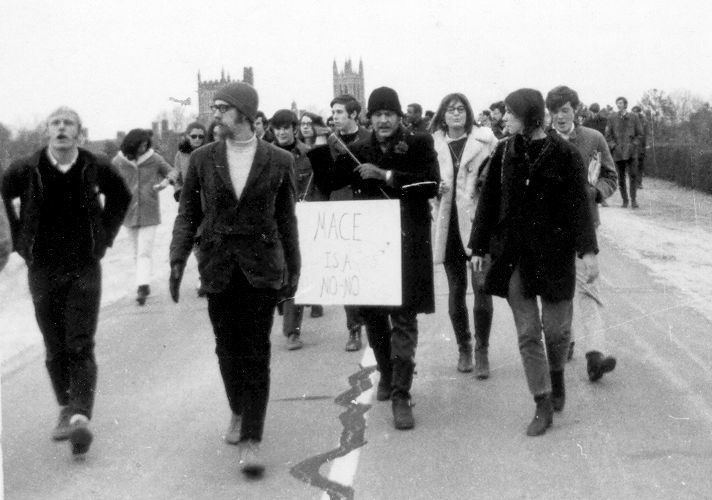 Here are some pictures I took during a 1969 campus protest which began with the occupation of the Allen Building.